WW1 Bruce Bairnsfather “Old Bill” Plate. 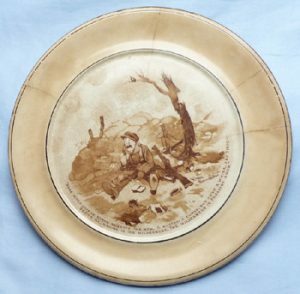 An original WW1 Bruce Bairnsfather "Old Bill" Staffordshire plate. With comic depiction of "Old Bill" to the front. With some age cracks in places - see the pics. Rare piece. Diameter is 10 inches.